Isabelle is a native of Canada, but was raised dividing her time between Paris and Vancouver. Isabelle received a Bachelor of Music from the University of Victoria studying with Jaroslav Karlovsky and obtained a Masters in Performance at the Cleveland Institute where she was a student of Heidi Castleman, Lynn Ramsey Irvine, and Robert Vernon. From 1990-2001, Ms. Roland was Assistant Principal viola of the Victoria Symphony, where she appeared many times as a soloist including a performance under the baton of Sir Yehudi Menuhin. Isabelle was the founding member of the Savitri Quartet with whom she performed for CBC radio broadcasts, as well as a collaboration with mezzo soprano, Susan Platts. 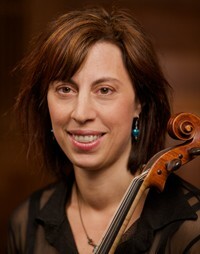 From 1996-1998, Ms. Roland served as Assistant Principal viola with the Colorado Festival in Boulder, Colorado. Since settling permanently in Vancouver in 2002, Isabelle has appeared as a soloist with the Sinfonia of the North Shore and the West Coast Symphony. Currently, she is Principal viola with Sinfonia of the North Shore, a member of the Vancouver Opera, and performs regularly with the Vancouver Symphony Orchestra, the Royal Winnipeg Ballet, and the National Broadcasting Orchestra. Ms. Roland also enjoys a busy chamber music career performing with Trio Accord, Music In The Morning, West Coast Chamber Music, and is a member of the Tantalus String Quartet. In addition to her busy performing career, Isabelle joins her love of music and children teaching viola and violin at VAM, and by joyfully caring for her two young sons, Nicholas and Kai, with husband, Steve Mason.